BETHLEHEM, PA—The Female Filmmaker Festival, premiere screenings of Zeke Zelker’s “Billboard” and a new block of films showcasing the work of aspiring filmmakers from area schools highlight an expanded Greater Lehigh Valley Filmmaker Festival (GLVFF) this April. The event, which takes place at the ArtsQuest Center at SteelStacks’ Frank Banko Alehouse Cinemas, is set for April 5-7. Tickets for all screenings are on sale now at www.steelstacks.org and 610-332-3378. On April 7, the Alehouse Cinemas will screen two works by acclaimed female filmmakers. The day kicks off at 1:30 p.m. with “Atomic Homefront,” which focuses on St. Louis’ atomic past as a uranium processing center for the atomic bomb, as well as the governmental and corporate negligence that led to the illegal dumping of Manhattan Project radioactive waste throughout North County neighborhoods. The film is followed by a Q&A/talkback with director Rebecca Cammisa (Cammisa via Skype). 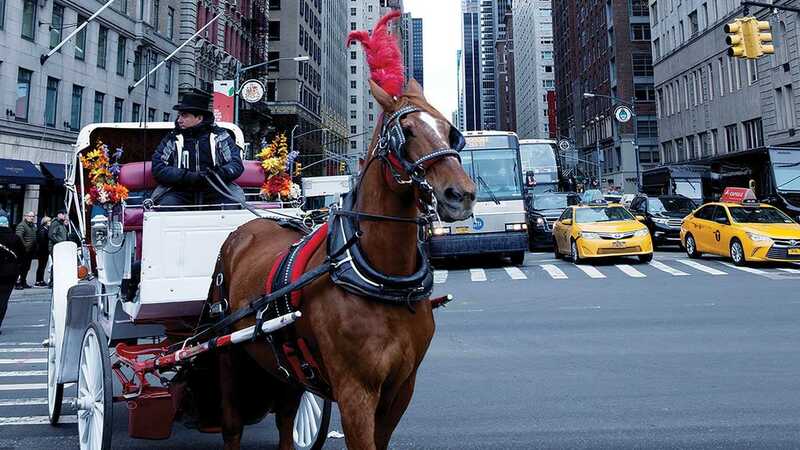 At 6:15 p.m., the cinemas will screen “The Last Horseman of New York,” a compelling documentary that follows the leaders of New York City’s horse carriage industry as they fight a mayor who has vowed to eliminate them on day one of his term. Cameras captured the struggle for two years, with the working-class carriage drivers under assault from animal rights activists and politicos funded by billionaire real estate developers with an eye on the stables. This film is followed by a Q&A/talkback with filmmakers Mary Haverstick and Michele Mercure. The day also includes the free Female Filmmaker Panel from 4-5 p.m., followed by a free networking session for filmmakers and panelists from 5-6 p.m.
“The Female Filmmaker Festival promotes the voices of women and their visions in today’s society,” says Katina Sossiadis Bozikis, who curated the event with Ann Knerr and Addyson Young. “Mary Haverstick and Rebecca Cammisa have directed two provocative films that break boundaries and push limits. This year’s GLVFF kicks off April 5 with three screenings of “Billboard,” the new film written, produced and directed by Zeke Zelker. Loosely based on a 1980s contest that required contestants to spend as long as they could living on a billboard, the film tells the story of Casey Lindeweiler, who inherits the last remaining independent radio station in town, only to find the station is in financial shambles and in the ratings basement. To right the sinking ship, Casey pulls out one of the oldest tricks in radio – the wacky contest. His idea is to host a billboard sitting contest where four people will live on a catwalk in front of a billboard in hopes of winning $96,000 and a mobile home. All they have to do is be the last one living on the billboard. At the conclusion of the 7:15 p.m. screening, Zelker will present a talkback on the film and answer questions from the audience. On April 6, the GLVFF is proud to show the works of students from Bethlehem’s McKinley Elementary School, Broughal Middle School and Lehigh Valley Charter High School for the Arts. The Student Block, which is free to attend, starts at 1:30 p.m. This is a FREE block, but admission ticket is required. Join us for a student showcase celebrating the works of elementary, middle school and high school students. Under the instruction of Drew Swedberg, the students of McKinley Elementary School and Broughal Middle School have created visual poetry they will screen. In addition, Heath Mensher of the Lehigh Valley Charter High School for the Arts will present his students’ films. Following the final block, the awards ceremony will take place to announce the winners including Best in Show, Best Narrative Film, Best Documentary Film and an Audience Award based solely on audience voting. The Best in Show film includes a $500 cash prize. This film reveals St. Louis’ atomic past as a uranium processing center for the atomic bomb, as well as the governmental and corporate negligence that led to the illegal dumping of Manhattan Project radioactive waste throughout North County neighborhoods. The film is a case study of how citizens are confronting state and federal agencies for the truth about the extent of the contamination and are fighting to keep their families safe. The screening is followed by a Q&A/Talkback with director Rebecca Cammisa. Free, but admission ticket is required. Please join us for a panel discussion with local female filmmakers from the Valley and beyond. Panel TBA. This documentary follows leaders of the horse carriage industry as they fight a mayor who has vowed to eliminate them on day one of his term. Cameras captured the struggle for two years, with the working-class carriage drivers under assault from animal rights activists and politicos funded by billionaire real estate developers with an eye on the stables. Christina Hansen and Stephen Malone, the two industry spokespeople, are thrust by necessity into the limelight and find themselves in a bare-knuckle brawl in a city known for political hardball. This saga has captured the headlines of every New York paper and launched investigations into the mayoral election and financing surrounding this issue. Joined by Liam Neeson, the carriage drivers and their horses remain on the street, but in a changing world the question remains: For how long?